Lava Iris 402+, the latest dual core smartphone from the company is now up for pre-order. The Dual SIM 402 + / plus is listed on the official website. 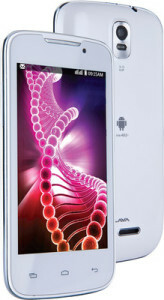 It features a 1.3GHz dual core processor, 4inch WVGA display and 3MP rear primary shooter. The 402+ has 3G support and it runs on Android v4.2.2 Jellybean OS. The Lava Iris 402+ is available for pre-order from online retailer flipkart at Rs. 5,678.